Malnutrition happens when the intake of essential macronutrients and micronutrients doesn’t cover, or exceeds, the body’s requirements for proper functioning. It is then a blanket term for under-nutrition, over-nutrition and micronutrient deficiencies. The bulk of the efforts towards battling malnutrition are focused on under-nutrition, as roughly 795 million people (or 1 in 9) are undernourished and about 98% of those 795 million live in developing countries (UN, 2014). Under-nutrition accounts for the stunting of 30 out of every 100 children in developing countries, as well as aiding in 35% of deaths caused by measles, pneumonia, and other illnesses in the same countries. This takes a massive toll on the population, as children who experience undernourishment early in life are at a disadvantage they most likely will not recover from, which leads to a loss of millions of potentially bright futures and the perpetuation of poverty. On the other hand, obesity (which is the most well-known face of over-nutrition) is becoming a pandemic. In 2013, 42 million children worldwide were obese and in 2014, 600 million of adults aged 18 and older were obese (WHO, 2015). This is alarming, especially when taking into account that most of the world’s population lives in countries where over-nutrition kills more people than under-nutrition. This article will focus on the causes of malnutrition, as the definition, signs and symptoms of this issue have already been discussed. Poverty: While poverty is not one of the direct causes of malnutrition, it severs food security and availability for those living below the poverty line. Furthermore, the foods poor people can afford are often void of any nutritional value and hence are just enough to keep the body working. The impact of poverty on nutrition is evident when considering that over 90% of undernourished people live in developing countries. Lack of access to food: This is directly affected by poverty, as insufficient financial resources hinder an individual’s access to food. However, lack of transportation and non-availability of foods in markets are also aiding factors. According to Action Against Hunger: “People are increasingly dependent on international markets for all or part of their food supply, particularly between harvest periods”. This dependence and fluctuating prices place low-income households at risk of food insecurity. 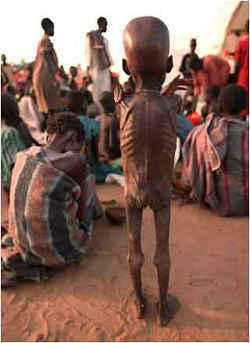 Disease: Illnesses like tuberculosis, cancer, dysphagia measles and diarrhea, are causes of malnutrition. Also, undernourishment weakens the immune system, which makes the body more vulnerable to infections that are also causes of malnutrition. This vicious cycle is especially dangerous with HIV, as under-nutrition can impair the effect of anti-retroviral drugs. This, in addition to the already depressed immune system, can be fatal. Conflict: Violence often displaces farmers and other links on the food supply chain. This issue compromises food security for farmers, as well as all the other people who depend on their yields for food. Climate change: An increment on the amount of natural disasters caused by climate change makes it one of the leading causes of malnutrition. In fact, according to a study by the UN, the decline in agricultural production caused directly or indirectly by climate change may drastically increase the amount of people living in hunger in the future. Lack of access to safe drinking water: The contamination of water sources as well as failure to sanitize them subject people to infections and water-born diseases, which are one of the causes of malnutrition, especially acute undernourishment. Increased demand of energy: Due to recent trauma or surgery that make the body’s energy requirement spike up in order to heal itself. Mental health: Illnesses like dementia, depression and schizophrenia affect people’s ability to take care after themselves, which encompasses nutrition. Crohn’s disease and ulcerative colitis are causes of malnutrition, for they impair the body’s ability of digesting food and absorbing nutrients. Eating disorders, as well as drug and alcohol addictions. Limited access to food: Low-income families in developed countries often lack access to healthy, nutritious foods due to their prices. Therefore, they have to opt for the highly caloric meals, which are mostly empty of any nutritional value. This people often meet the requirements for certain nutrients but not all of them. Having a healthy diet and lifestyle and consuming dietary supplements: This is mostly seem in people who lack nutritional education. Hence why they’re meeting their daily nutrient requirements and still taking supplements, which results in an overabundance of one or more nutrients.